The ELTChat was about teaching online. It proved to be a popular and exciting discussion, not least because it really got me thinking of the next step I need to take in my career (Fuertesun). This is true. 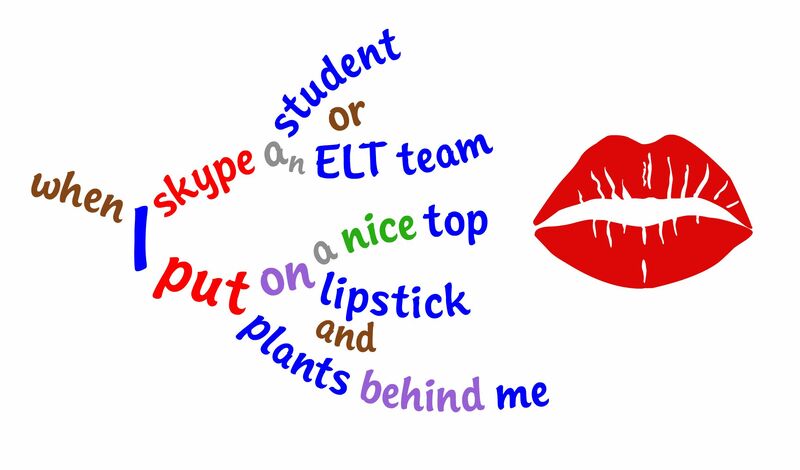 We have already entered an age where we can teach in our pyjama bottoms, even if when I skype a student or ELT team, I put on a nice top, lipstick and put plants behind me. Nutty? (BethCagnol). This is a great topic and one that will become more and more of a feature in ELT, I think (rliberni). There was a wide variety of online experience amongst the participants. I’m interested in becoming an online teacher, but don’t really know how to get started. Any advice? (theteacherjames) whereas after 4 years of E-learning I’m really changing my view a lot and doing things very different to how I started out (rliberni). Some have also taken online courses, so have experience from a learner’s perspective. I did my M.A online. It was a painful and enjoyable experience at the same time (lolonagi) and here’s a post I wrote about being an online student on an IH Online Teacher Training course http://bit.ly/j61yVc (sandymillin) and my whole course is delivered by modules within a virtual learning environment (VLE) (boyledsweetie). Here’s a student’s perspective: Benefits of Online learning (Guest post on Teaching Village): http://tinyurl.com/3f328jg (tarabenwell). Is this useful for being an online teacher? Definitely! Getting experience first as an online student will really help make you aware of what is involved with it (janetbianchini). Teaching online is a new skill, and needs to be learned. Good online teachers have to be masters of the technology being used (LARC_SDSU). If not, you can forget all about good teaching practice: I just starting talking too much, forgot to talk to the student, the unfamiliar made me nervous (dreadnought001). So prepare yourself: A great book is “Teaching Online” by Nicky Hockly and Lindsay Clandfield http://tinyurl.com/6jwoqsj (janetbianchini). Online, I’ve come across this article that lists Top 8 traits of a Good Online Teacher http://bit.ly/b5kUiw (cintiastella). Another way is to take a course – LANCELOT, IH COLT, the Consultants-E to name a few – all are slightly different (hollysuel). I’m planning to do IH Certificate in Online Tutoring http://bit.ly/kMLieU later this year to get some more ideas (sandymillin). Or you can take the plunge and try tutoring a student you already have on a one-to-one basis first so you can get used to it (Marisa_C). If you want to be an online teacher, you can work for an online company. Here’s a blog post on companies that hire/help you find students: http://bit.ly/kDNaQR and a few others include Myngle, Edufire are free markets–Tutor ABC, TalkBean & ESOL Nexus are direct hires (hollysuel). Or you can go it alone, in which case, you need to market yourself. Guy Kawasaki and Seth Godin are good to follow and a must read free ebook about marketing is Seth Godin’s The Idea Virus http://bit.ly/l4YmZV (ShellTerrell). Also create a PLN and use twitter. So, what synchronous teaching tools are there? It seems there are lots, and changing all the time. It’s a full-time job just keeping up! Jing seems to be a favourite with everyone! (Marisa_C). I learned to use Jing by watching Russell Stannard’s Training Videos, they are great! http://bit.ly/PldsH (cintiastella). scribblar is a really good online collaborative whiteboard which is developing all the time (HelpMyEnglish). I have a bamboo board that I can use in virtual classrooms – no need to type (hollysuel), whereas I have definitely found Elluminate the easiest synchronous platform (Englishonthenet). I use Skype only to interview people (Marisa_C). But can we trust technology? There’s the obvious: different time zones, bad connection. However, it’s much better, more stable and getting better all the time (rliberni). Even so, with technology, it’s not enough to have plan B – you need a plan C, D and E (Englishonthenet), and so many teachers resist online teaching for fear of the technology going wrong (Marisa_C). I don’t often use webcam as students haven’t got them, problems with bandwidth etc. (rliberni). So what do students actually think? Surely that’s the most important question! They begin by resisting but then only want to be taught online (Marisa_C). It’s not easy to help people over their initial resistance but once they get hooked they’re fine (Englishonthenet). I worked with older and younger students some hi-tech and some low-tech who couldn’t figure out chatting (ShellTerrell). It’s not plain sailing. But let’s imagine we’ve got the students there. Are all out problems solved? Don’t you believe it! Another problem is getting students to commit regularly to attending courses and finishing assignments (ShellTerrell). Online students seem to cancel more easily – you need to be flexible as a trainer (Englishonthenet). So, to combat this, lots of email nudging, reminders, blogs, webinars etc, keep your learners lives in mind and help them not fail (Boyledsweetie). It’s hard work to prepare, a lot of time checking messages, attendance etc and the students got demotivated unless they join chats (fionamau). And what about money? Another problem is getting students to pay – some think everything on the internet should be free (hollysuel). Anyway, we’re off and running. What should we be aiming to do to make it a successful course? Having students get to know each other is great for building a community! What’s your favorite intro online activity? (ShellTerrell). You can make use of your location. A fabulous intro – View from my window – show a picture of your view, and invite students to do the same (janetbianchini). It naturally follows to get your students to create a photopeach slideshow of their country. First show them yours and then they do one. It’s great (janetbianchini). A similar activity is to have the students upload a favorite picture and talk about it (hollysuel). And then there’s the dogme activity “Story of my name” http://tinyurl.com/62dwtso (tarabenwell). And another getting-to-know-you activity, the 30 song challenge: http://bit.ly/iMwFiV. In fact, everyone being in different locations can have its own advantages: a bird flew in through my window the other night whilst I was on camera. A chat box of hilarious comments kept us all laughing for 10 minutes (boyledsweetie). So, an ocean of opportunities, it seems. And thanks to this wonderful PLN and forums like ELTchat, the friendship and support to help us navigate. I love how you did the summary – how you mentioned the links after every important point mentioned by one of the ELTChatters. Unfortunately, I had to miss the evening session (I always teach through the noon one, so I always miss that one), so your summary is excellent to check out. I will surely get a lot of tips for my online lessons, as I do not have many right now and my experience is rather limited. I always like your word plants – awesome idea! Ideal for a …Language Garden! Hi Vicky, thanks for the comments, always nice to hear from you, thanks for the RT too. I thought it was a very good chat, which is why I offered to write up the summary. I hope it makes up for you not being able to join in live. Sure does make up for not being there! it is written so nicely, I could follow through and the links are so nicely connected to the tweets. Excellent work – and you’re very welcome! Thank you for writing it. My timetable never lets me participate in #eflchat, so I can only echo Vicky’s sentiments. A very clear, very concise, very attractive post. Will check out Jing, BTW. Thanks to you and the other chatters. PS Is Gates parodying Churchill? Thanks Al, it’s too close for it not to be, don’t you think? I really like your summary and your way of creating language plants. Thank you! Thank you Sandy, very kind of you to say so! I tried to keep the summary quite short, but there were too many comments, I still had to cull lots I wanted to keep in. Great summary David! I’ll share this with our tutors who support those doing our distance-learning Trinity Diploma and Cert IBET courses – some useful tips indeed. Hi Josh, thank you for visiting and commenting. I enjoyed writing the summary. I think many of us are considering online teaching to some extent. I researched the links given, there are so many, some seem very good, others are difficult to learn how to use. One of the best #ETLChat summaries to date! This is a fantastic resource. Thanks David! You are currently reading ELTchat Teaching Online Summary at language garden.